The BFAWU welcomes the raise in pay announced by McDonalds corporation it demonstrates that when workers stand together and take strike action that workers can win. We congratulate those who took strike action and stood up for fairness this increase is due to their courage and commitment to improve working conditions and the lives of those who work in McDonalds. Our members have faced injustices exploitative employment practices as well as low pay. 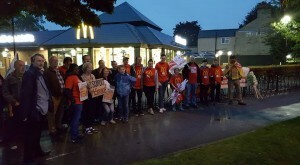 On the 4th September after trying to resolve grievances our members took strike action calling on McDonalds to raise pay end it’s use of zero hours contracts and its culture of bullying. By taking this action our members shone a light on an organisation that has led the race to the bottom not just in the UK but across the world. These courageous workers demanded to be treated with dignity and respect something that all workers deserve, and when you work for the second largest employer in the world which makes profits in the tens of billions you expect to be able to receive a wage that enables you to live. This pay rise is a step in the right direction for all of McDonalds workers but by no means is it the end of the campaign if just 30 workers can lift wages above anything McDonalds have raised in recent history or being forced to through legislation then imagine what we can do when thousands organise across McDonalds and what we will achieve. Our members are still demanding a real contract of employment a minimum wage for all of at least £10 and an end to the culture of bullying and harassment in the workplace.